Beatties Biscuits came about through my love of cheese biscuits with a gin and tonic shared on the veranda with my family. As a chef by profession over the last 20 years l have loved using the biscuits on many occasions: drinks before dinner, cocktail parties, afternoon tea, art openings, corporate gatherings - you name it - I'll always find a reason why a Cheescuit is needed. Over the years people have asked if they could buy small packets of biscuits for their own home entertaining so I began to stock the gourmet shops I loved shopping at. In 1998 my husband and I moved to the foothills of the Victorian Great Dividing Range - which I love. 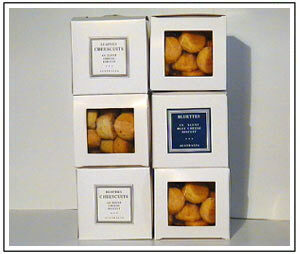 My business has grown to four varieties of biscuits sold all over Australia. When I see them in a great shop or someone serves me one of my biscuits at their home - I just love it. I have taken years to source the best possible ingredients for my biscuits and they are all made by hand and with love.